More roster movement today as the Lincoln Stars announced the acquisition of '96 forward Waltteri Hopponen from the Sioux City Musketeers. Hopponen is a native of Espoo, Finland and will count as an import on Lincoln's roster. Click here to read the official announcement from the Lincoln Stars. 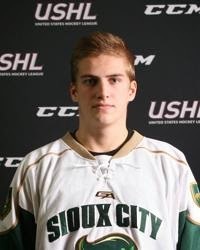 Per this link, the Stars sent a conditional 5th round pick in the 2015 USHL Phase II draft to Sioux City for Hopponen. In 82 games for the Sioux City Musketeers over the past 1.5 seasons, "Walt" scored 41 points (19g, 22a) and racked up 95 penalty minutes. Additionally, Hopponen has participated for the Finnish national team in a variety of international tournaments. Hopponen came to the USA after he was selected by the Everett Silvertips in the first round of the 2014 WHL Import Draft. Walt played one game for the 'Tips before he was released because of the WHL's import rule. Click here to read more about that. Sioux City head coach Jay Varady used to be a former assistant coach in Everett, so when Hopponen was forced to look for another league to play in after Everett released him, Walt made the decision to come the the USHL and play for the Muskies. Because he played that one WHL game, Hopponen is not eligible to play college hockey in the USA. Knowing that, there the potential for Walt to play in the USHL and for Lincoln for the remainder of this season, and two more seasons. It's impossible to predict the future, but having him in Lincoln for the next 2.5 seasons would be great. On paper, I'm a big fan of this trade. He has good size, and isn't afraid to throw his body around or drop the gloves if needed. He also has good hands and can put up some points. A few years ago, a played named Christian Lampasso played for Sioux City. Whenever the Muskies came to the IceBox I thought to myself, "Man, I wish we had that Lampasso kid on our roster." The next season, Lincoln acquired him. In my prior viewings of Hopponen, I've thought the same. Glad that he's on our side now. Yes, his scoring this season through 28 games has taken a hit. Last season for the Muskies, when he scored 31 points in 54 games, Walt averaged a point in every .57 games. This season, Walt averaged a point in every .36 games. Hopefully the change of scenery will jump-start his offensive numbers. I'm going to post a video below of an interview Hopponen did at the 2014 Junior Club World Cup in Russia in which the Sioux City Musketeers competed in. In six games at that particular preseason tournament, Walt scored 7 points (5g, 2a). I couldn't agree more. This kid seems to bring alot of what the Stars really need right now--experience, size, scoring ability, and can play physical. I know there are many people who are a little disappointed about where we are in the standings right now, but lets face it--most of us knew with a new coaching staff and so many young players, this was going to be a rebuilding year. As it is now, we're at least poised to still make a run at this years playoffs and next year is shaping up VERY well....experience goes a long way in this league and all of our young players will be considerably more seasoned. I'm still really excited about how this team is progressing.